Jadyn Erin Larky was a sweet and fun-loving girl who enjoyed spending time with her family, eating ice cream and giggling with her friends. 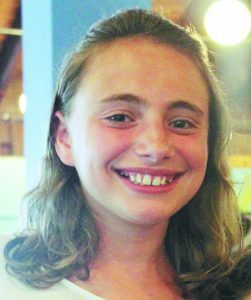 Jadyn’s young life was cut tragically short when a tree fell on her cabin at Camp Livingston in southeast Indiana during a severe thunder and lightning storm in the early morning hours of June 21. She was 11 years old. According to Jadyn’s father, native Detroiter Howard Larky, Jadyn was a kind and gentle girl who always had a smile on her face. She was especially close to her little sister, Elliot, whom she never failed to hug and kiss good night. Jadyn lived in the Columbus, Ohio, suburb of Bexley. She was an ardent fan of the University of Michigan, however, the alma mater of her mother, Liza, and father. She proudly wore her U-M shirt and was looking forward to spending her fourth summer at Camp Michigania near Charlevoix with her family, where she enjoyed archery, arts and crafts and water sports. She was a good student who realized that hard work was an important component of success, even at such a young age. She was a member of the girls’ lacrosse team at her school; she also took karate lessons and frequently participated in CrossFit sessions with her father. She was fascinated by cars and had started learning about the various brands, makes and models. One of Jadyn’s great pleasures was visiting with her Metro Detroit family: grandparents Sheldon and Barbara Larky; aunt and uncle Lorie Savin and Adam Larky; and her cousins Elizabeth and Abigail. “She loved spending time with her cousins, and no trip here was complete without a visit to Steve’s Deli for chicken noodle soup,” said Sheldon Larky. To honor the memory of their friend, neighbor and schoolmate, the Bexley community started a white ribbon campaign, adorning clothing, trees and Facebook photos with white ribbons of all shapes and sizes. “We saw close to 1,000 trees between Bexley and Columbus decorated with white ribbons,” said Sheldon Larky. She enjoyed going to sporting events with her father, admitting she enjoyed his company more than whatever game was being played. Jadyn is survived by her mother, Liza (Terri Moore); father, Howard (Lori Kaethow); sister, Elliot Hannah Larky; grandparents, Barbara and Sheldon Larky and Debby and Jerry Yarov; great-grandmother, Cecile Freedman; uncle and aunt, Adam (Lorie Savin) Larky; cousins, friends and other relatives. A private service and interment were held in Ohio. Those wishing to make a donation may contribute to the Jadyn Larky Camp Scholarship Fund c/o Columbus Jewish Foundation, 1175 College Ave., Columbus, OH 43209. May all the good memories of Jadyn be a blessing. May her beautiful smile carry your family through this time of grief. I’m so sorry for everyone’s loss of this sweet, young bright soul. Thinking of her family during this times.